Black hearts, they said, signify the government’s lack of concern for the plight of health workers, most of whom suffer from long hours of work with not enough take home pay. 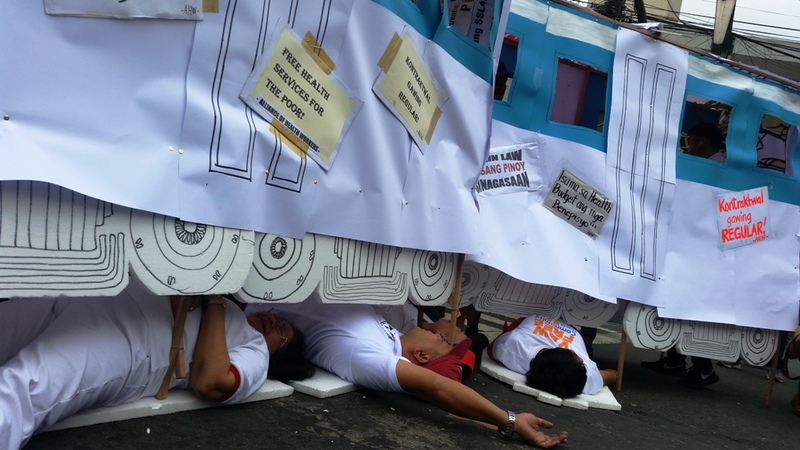 MANILA — On Valentine’s Day health workers took to the streets with their calls written in black hearts that they carried marching from España Boulevard to Chino Roces bridge (former Mendiola bridge). 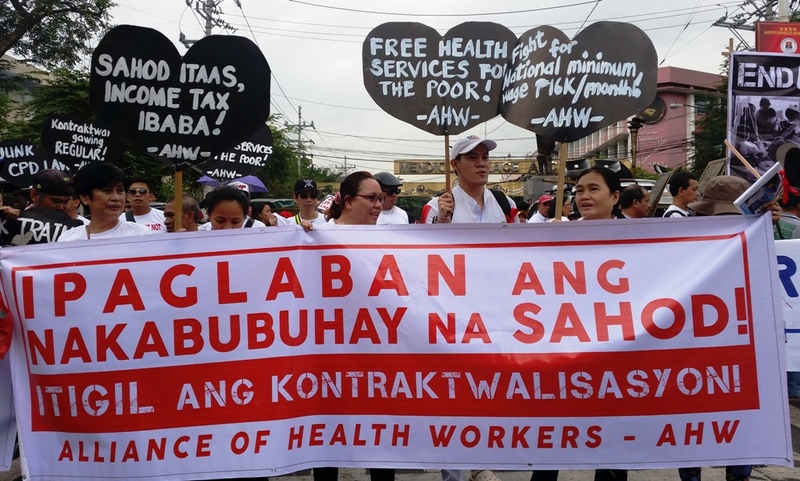 Dubbed as Black Hearts Day, the health workers led by the Alliance of Health Workers (AHW) still have the same long time calls — salary increase, payment of overdue benefits, an end to contractualization, the scrapping of the burdensome Continuing Professional Development (CPD) law and the Tax Reform for Acceleration and Inclusion (TRAIN). Black hearts, they said, signify the government’s lack of concern for the plight of health workers, most of whom suffer from long hours of work with not enough take home pay. Health workers from private and public hospitals joined the protest. They lamented that their condition is getting worse as neoliberal policies continue to be implemented by the government. 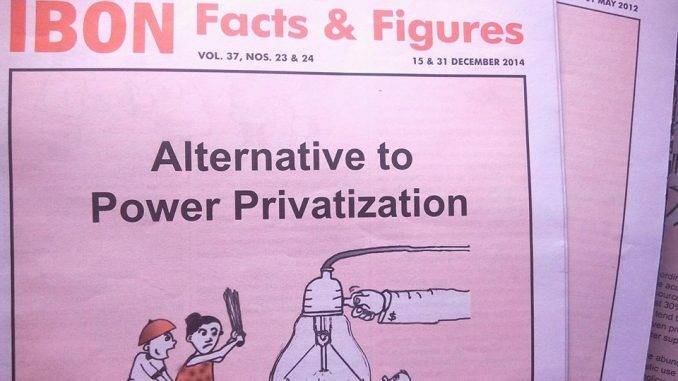 Robert Mendoza, AHW chairperson said their salaries could note cope with the incessant price hikes and payment of their benefits has always been delayed. Instead of increasing their salaries, he said, the government implemented TRAIN and CPD law that made their lives more difficult. “We also play a vital role in saving lives, rain or shine, but we are being neglected by the government,” he said. The Continuing Professional Development Act of 2016 was criticized by licensed professionals as it requires them to earn credit units before they could renew their license. The licenses are renewed every three years. For nurses, they needed to earn 45 units in three years through attending trainings. The trainings must be given by accredited CPD providers. The problem is that the trainings are not being provided for free, said Joselyn Andamo, secretary general of Filipino Nurses United (FNU). For one, Andamo said, online trainings called self-directed learning under the CPD law cost P1,000 ($19.26). If the nurses will spend for 45 units, that would be a total of P45,000 ($867). Nurses in rural areas also have difficulty in accessing the self-directed learning. She said nurses who are deployed in far-flung areas have to go to the city center to access the internet. “The problem is that nurses are underpaid. Private hospitals, for example, give nurses a salary of P7,000 ($135) per month. If they have to spend a thousand for their training how much will be left for their family?” Andamo told Bulatlat in an interview. Andamo said nurses are having problems in complying with the CPD law as they are already burdened with low salaries, long working hours and thousands of patients to attend to in a day. Sean Herbert Velchez, registered nurse at the Philippine Orthopedic Center and convenor of Laban Nurses Movement, meanwhile, said professionals, even without the CPD, have been undergoing trainings as they recognize the need to be up to date with developments in their profession. However the implementation of the CPD law has become more of a business. “CPD is like a gun poked at us, we cannot do anything because if we do not comply, we could not renew our licenses. How can we work?” Velchez told Bulatlat. The health workers also lament the long overdue payment of the Performance Based-Bonus (PBB), which has not been released since 2016. Mendoza said they held a dialogue with the Department of Budget and Management(DBM) last month. They were told that the DBM is now processing the papers that were submitted by the Department of Health. They were also told that their PBB would be released after two weeks. There are also technicalities in the release of the budget for the PBB that is why, Mendoza said, they are not expecting that the two week deadline of the DBM would be met. “There is no assurance that it will be released because the budget for circular year 2016 was already spent as well as 2017. They told us that the budget would be sourced from the 2018 budget but what if the Commission on Audit disallowed it?” Mendoza told Bulatlat. Meanwhile, health groups also reiterated that the salaries of health workers and other government employees should also be increased. “The cost of living is rising because of the implementation of the regressive TRAIN law this year,” said AHW secretary general Benjie Santos. 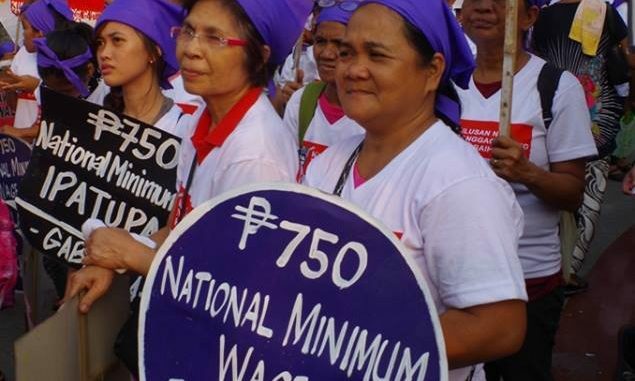 The group is pushing for a national minimum wage of P16,000 ($308) per month for government employees and P750 ($14.45) per day for private employees. The health workers vowed to intensify their protests until the government heeds their call. The post Black Hearts Day | Health workers slam CPD law, delayed release of bonus appeared first on Bulatlat.